Typical behavioral problems can be recognized with the help of the "Inspections" feature. Inspections enable automatic high-level analysis of built-in probe results. 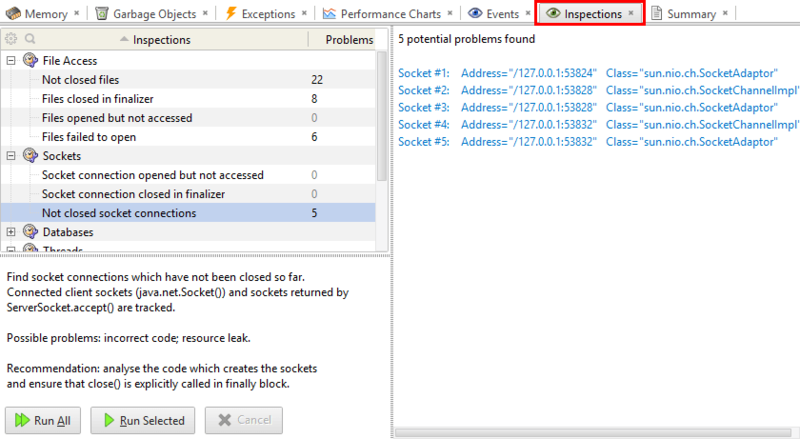 Each inspection automatically detects a specific issue. Performing this type of analysis by hand would be a very complicated (if at all possible) task. With the help of inspections you can easily find the causes and possible solutions of usual problems. The feature is presented with "Inspections" view. (1) To run all inspections as a batch use "Run All Inspections" button. (2) To run a single inspection, select it in the tree and use "Run This Inspection Only" button (this is especially useful if you want to apply the changes made to an inspection's options).